The Democratic Party’s dominance of the coasts will be evident when the new Congress convenes in January. A chart from the report shows the distribution of Democrats and Republicans in the new Congress. 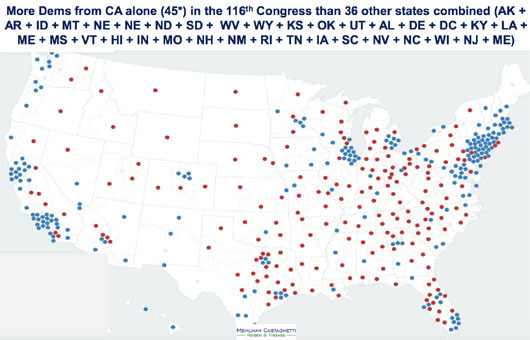 The Washington, D.C. firm Mehlman, Castagnetti, Rosen, and Thomas noted in an analysis that 155 of the Democrats’ 233 House members will be from the East or West Coast. The will be more Democrats from California alone – 45 – in the 116th Congress than 36 other states combined, the analysis said. The analysis also noted a significant reduction in so-called “purple states” that have both a Democratic and Republican senator. Once 27 states during the Reagan administration, there are only nine now. The analysis it found that the 2018 midterm elections produced the fewest states with split legislatures since 1914. The analysis also confirmed that the percentage of voter turnout for the midterms was the highest in 104 years.